When Nico was 3 years old we spent 4 days and nights at Great Ormond Street Hospital where he underwent an extensive battery of tests, designed to get to the bottom of what was affecting him and give us a clear diagnosis. The testing had been arranged for us by Scope. They told us that knowing what was causing Nico’s problems would help us with his education and give us a good idea of what we might expect in the years to come. We had a private room in the children’s ward and Ian and I took it in turns to sleep besides Nico on a fold-out bed provided by the hospital. During the days we wheeled Nico around the hospital, from department to department, as he went from one test to the next. He was distressed by having electrodes stuck to his head, but they showed that he didn’t have epilepsy. He enjoyed the sight and hearing tests (particularly the hearing, as it involved music) and we were told he had perfect hearing and might need glasses later on, but had good eyesight. At this point one of his eyes would “wander in” when he was tired, but they told us that this would right itself as he got older and his eye muscles became stronger. Tests proved that his overall muscle tone was low, including his internal muscles. Ironically we were told that this was the reason why he found it almost impossible to be sick – his internal muscles just weren’t strong enough to allow him to vomit. The doctors were leaning towards a diagnosis of athetoid cerebral palsy. One day Nico spent being examined by a group of your doctors under a senior doctor’s guidance. It was this doctor who drew our attention to the lesion on the back of Nico’s head and asked more questions about it. We told him that he was born with it bleeding – not badly, more like a graze and that at the time the midwife said he had scraped it on the inside of my pelvis. But the doctor told us that the lesion wasn’t scar tissue and that the pelvic scrape idea didn’t make sense to him. He asked us if it had grown over time and it had. He told us that he suspected that it was the outward manifestation of a similar lesion on Nico’s brain and the sign of a rare syndrome, a form of Jadassohn Syndrome, not life threatening in any way, but it would almost certainly affect Nico’s motor function considerably. He recommended that we got Nico into a programme of intensive physiotherapy in order to maximise his potential as much as possible. The final tests were for Nico’s IQ. The results were inconclusive as the doctors explained to us that they had no definitive tests for children with profound disabilities like Nico, however based on how he had performed in the tests they said that they believed him to have an above average IQ, a level of understanding suitable to his age group and if he had help with communication, he would be able to make his wishes known and was perfectly capable of making decisions. Their actual words were “he’s a pretty sharp little character, not much gets past him does it!” He was not diagnosed as learning disabled, was not on the autistic spectrum and had no epilepsy. However, we left Great Ormond Street with a child as floppy as a rag doll, doubly incontinent, unable to sleep at night and without communication. To find out what happened next you’ll have to keep following these blogs. We were to spend the next 15 years with paperwork that either said “athetoid cerebral palsy” or “cerebral palsy like symptoms” or “presents like athetoid cerebral palsy” and in later years the blanket label “PMLD”. Apparently the phrase “what’s in a name” no longer applies as soon as you talk about a disability and the name you are labelled with becomes extremely important. You soon realise that the name, the diagnosis, the condition – whatever you want to call it, that you child has (I don’t actually like to use the words “suffers from” as it implies suffering and pain which is something Nico didn’t have) becomes WHO your child is. Instead of just being Nico Reed, your child becomes athetoid cerebral palsy boy and the label of his diagnosis follows you from meeting to meeting, department to department and from doctor to doctor. Soon the paperwork that comes with your child fills folder after folder, box after box and all labelled carefully with the different kinds of letters they are and almost every one of them puts the name of Nico’s “condition” next to his name and date of birth. But in our family we resisted this robustly because we saw everything that he could do and the love we had/have for him was absolute and consuming. Nico was amazingly easy to love, not least because he loved in return. In early June this year (though I find it hard to believe it’s only been such a short time) I wrote to Gail Hanrahan and Sara Ryan after seeing Sara’s campaign #justiceforLB unfolding on Facebook. My initial contact with Gail was through Facebook and I was very tentative at the beginning, but they both embraced me so warmly and gave me such heartfelt and wonderful support, that I got past my initial reservations and began the #justiceforNico account on Twitter. Then one of Sara’s supporters, John Williams then helped me to set up this blog (without him I’d probably still be banging my keyboard in frustration). Many of Sara Ryan’s wonderful support team and supporters have flocked to support me too, which feels astounding and quite wonderful, but in their messages to me they talk about autism, learning disability and challenging behaviours. I know about these of course. I’ve known many young people who fall into some/all of these categories and have these names and labels…….but Nico wasn’t one of them. Nico aged 3 loving his first time in a swing. made me think again about the issue of names and labels. Nico was very particular about what you called him. He liked to be called Nico. His loving sisters were allowed to call him Mr Ginge, Nicodemus or Fat Boy and sometimes his dad and I were allowed to use those nicknames too. His friends from Penhurst called him Mr Nico or Mr Reed and he was fine with that too. But he was very proud and very particular that you use his name when you spoke to him or about him. If you didn’t know him and called him something other than Nico he would curl his lip, furrow his brow and make you feel under no illusion that you had offended him. Does it matter what we call these wonderful young men and women who we are fighting for? We know their names and we can call them by their names, but sometimes it’s useful to have a way of describing all the young men and women like them (I really wish I didn’t have to type that sentence – wish that there were no other young people or parents who have been through what we’ve been through and are still going through). However, in calling all of our young people by one generic name – are we simply putting yet another label on them? It takes only one glance at any photo of Connor Sparrowhawk to see that, without doubt, this guy was a DUDE! His loving family who knew him better than anyone else in the world have the right to call him whatever they want to – because he is theirs – their son, their brother, their grandson, their friend. In allowing us, who didn’t know him, to call him by that name Sara Ryan honours us, because she is allowing us to share in the special part of their loving bond. But now I am followed and read by people who are striving for justice and for an end to the horrendous practice of taking young people away from all they know and love and putting them into assessment and treatment units – and then refusing to let them out and back to the family that loves and needs them (and although this is bad enough, then to fail them in their care so dismally that they die). But this isn’t Nico. This isn’t what happened to him and this isn’t his story. Nico – not learning disabled, not autistic, no challenging behaviours, but still failed by the system in the most callous and calculated way. He wasn’t a dude but he was a young man who was going to have a normal life expectancy and who loved life. Now I’ve written this and admitted that the support we’ve received through the social media has almost exclusively been from people who are pushing hard for change for young people with LD, autism, epilepsy, challenging behaviours and assessment and treatment units – where does that leave us? Hopefully these people will NOT desert our cause nor let our banner falter or fall because Nico Reed came with different names and labels. Maybe some new people to whom the names and labels of PMLD, cerebral palsy and other syndromes will see our banner now and come towards it. Or maybe it’s just time that we stopped with all the names and labels. Can’t be bothered to beat around the bush and be polite. Let’s just find all those people who refer to your lovely boy as “the wheelchair” and kick them. A few deft blows to their shins should make them think twice (Don’t worry, I am joking….I think). What I used to do in those circumstances was ever so gently and apologetically run over their toes. Made ME feel better! What a beautiful boy – that hair – he looks very happy. Great hair! Now you know why his sister called him Mr Ginge…..
Thankyou. All our children have names different personalities and abilities / disabilities. They all require our love, nurturing and protection. All us mums and dads fight daily for our children on one level and another to obtain the services, education they deserve and need. My son is autistic , learning disabled, and has PTSD from restraint at his specialist educational placement he attended daily until he, bless him, told me he wanted to kill himself. He is 16 now. He is in a safe environment now but even 5/6 years later we live with aftermath of this. I didn’t fight or ask much at time as I was overwhelmed dealing with fall out. You and Sarah are empowering me and I have begun to ask questions now. I feel a bit awkward around the idea that I could have empowered someone. Mostly I feel in need of empowering myself! I sounds as if you’re had a pretty bad time of it (to put it mildly) and it makes me wonder just how many other parents are in a similar situation to you (and to me). It’s just not good enough and it’s time that we made a big fuss. The sad truth is that unless we become visible and audible to everyone (not just people like each other) we won’t be a big enough nuisance for THEM to take notice of us! As I said in my original post, I don’t have a problem with Sara Ryan calling her son a dude. What I’m against is people using it inappropriately. For example, I saw one blog post in which the author said that her adopted daughter was a dude, and her birth mother was also a dude, and the birth mother died long before anyone started using this language (I’m not sure if she asked the adopted daughter if she minded being called that), and she was obviously a woman. We wouldn’t be calling everyone with a learning disability a lass or a lady if it had been a young woman who drowned last July, so why are we calling them dudes just because Connor happened to be one? There are a huge number of issues surrounding learning disability care, and they can be broadly grouped into bad care (which includes the obvious failings at STATT and the deliberate cruelty at Winterbourne) and people spending too long in hospital units for a variety of reasons: lack of adequate provision in the community (often caused by cutbacks), and clinicians who judge their patients’ general behaviour on how they behave in the specific setting of a residential unit which is full of strangers and strange rules. Some of these clinicians abuse the Mental Health Act to get their own way and to fend off challenges from patients and their families (this is happening in Claire Dyer’s case, and was threatened in Steven Neary’s). Even with a good hospital unit, however, I’m sure we would all agree that nobody should be in one (especially if it’s far from home) for years just because there’s no provision for them to live in the community — you may have heard of Josh Wills who has spent nearly two years in a hospital unit in Birmingham because there’s no suitable facility in Cornwall. His parents (he is 13) have no qualms with the care he’s receiving, just with the distance. Many of the people involved in this campaign are parents who have faced one of these two situations, or perhaps both. Some of us have other reasons for being involved — I have Asperger’s syndrome and have considerable experience of British ‘special’ education (the school I was at is the focus of one of the current abuse inquiries). Others, like Kaliya Franklin, have physical impairments, but even there, people have faced misguided mental health treatment because their conditions are misunderstood (ME sufferers get the worst of this). The two issues I mentioned are obviously related, and the community is pretty small and people are working together quite well. It was through Mark Neary (Steven’s dad who runs the “Get Steven Home” FB group) that I first heard of Sara and her son (long before I learned his name; that happened only after he died) and of Claire; it was through Sara that I heard of you. Thank you so much for this comment Matthew. After we lost Nico it didn’t occur to me to “go public”, it’s really not mine and my families’ style. It was really only when I became aware of the huge furore surrounding Sara Ryan’s campaign that I began to feel the pain of both having lost Nico and of being sidelined and ignored by S.H. Of course no-one in the wider world could support us as they didn’t know about us. So I made the step to create the twitter account and the blog. It’s all still very tentative and new for me. A medium I’m not really familiar with and I find myself still very intimidated by talking to and with people who are so obviously far more educated than myself, as well as far more qualified to write about this subject. Almost every day I’m learning something new, though I’m pleased to say that I was following Steven Neary’s story from when the national press started to cover it and I continue to follow the story of Josh Willis. I enjoy reading your blog very much, though I must confess that some of it goes above my head, but these are just words and expressions I’m not yet familiar with. 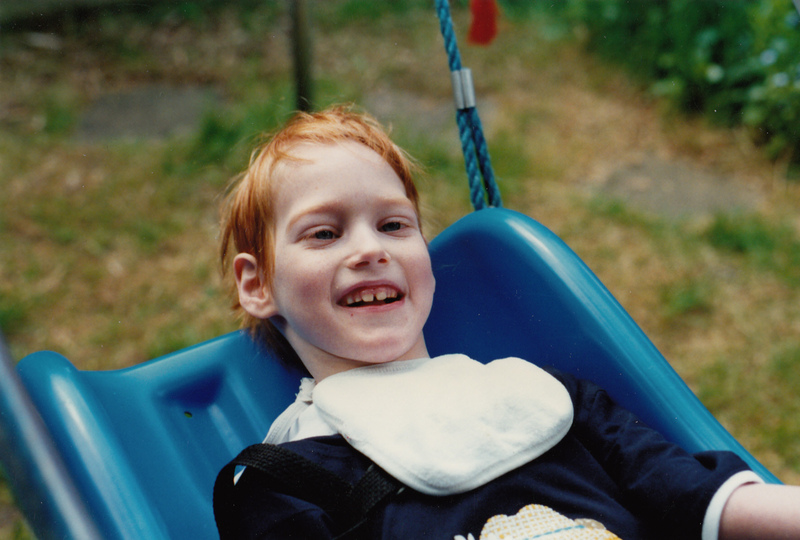 What I really what I wanted to say in this blog post was that, from the moment you have a disabled child, you are transported into a world of labels (which you so clearly have personal knowledge of) and how weary I have grown of labels. I know that when people use the word “dude” they mean it kindly, but it’s not a name we would ever have used with Nico – he wouldn’t have cared for it. However, since I have written this blog I have already had two people on Twitter praising it and calling Nico a dude! So it seems that either they didn’t read it my blog, or have decided that now this word is something that I should embrace regardless! I would say when Sara refers to Connor as a dude it is meant in a light hearted and affectionate way, she is saying ‘hey take a look at him, he is happy healthy funny quirky and cool! he has ( or should have) the world at his feet’. That isn’t a label and doesn’t apply to everyone, again it is how people interpret language ( which is extremely hard by text) plus light heartedness . Some other people will pick up a word and just use it without much thought. Thanks Lisa, cause I like it too! Good reply. The whole point of writing something like this is to encourage people to talk and give opinions, but mostly it’s so that I get to say what I want to say without it having to be in 140 blinkin’ characters! Rosi, what a brilliant blog piece, you are spot on about the labels and how we are processed. My son is 14 and has CP in his list of labels. We have to keep focusing on our teenager who is loving and funny even if he can’t communicate verbally and is fed by tube. I’m learning so much from your and Sara’s blogs, so thank you! Thank you so much! If anything I write could be helpful to anyone in any way then it’s worth all the late nights, missed meals and general grumpiness that goes into producing each blog! Give your fella lots of hugs from me please and keep in touch, so I know how things go on for you. I hope I come up with a few more posts you enjoy reading.